Sigma lenses have been getting more and more popular in recent years thanks to some truly professional-grade optics (like the 35mm f/1.4 HSM Art, for example). As every other manufacturer, however, they use different designations for various bits of technology incorporated into the lenses. In this article, I will go through the most important Sigma lens abbreviations you might come across. Thankfully, there are not that many of them despite the fact Sigma has a broad lens line-up, so there’s not all that much to remember. C (Contemporary) – this product line consists mainly of variable aperture zoom lenses for general use, such as standard and telephoto zoom lenses for APS-C cameras (the Sigma 18-200mm f/3.5-6.3 OS HSM Macro C, for example). The way I see it this is basically the place for Sigma’s budget zoom lenses, of which there will be many. A (Art) – you will find all the fastest Sigma prime lenses to belong to this product line. Sigma says the Art lineup is “designed with a focus on sophisticated optical performance and abundant expressive power”. Some wide-angle, macro, fishey and fast-aperture zoom lenses will also belong to this category (the 18-35mm f/1.8 HSM A is a good exampl). 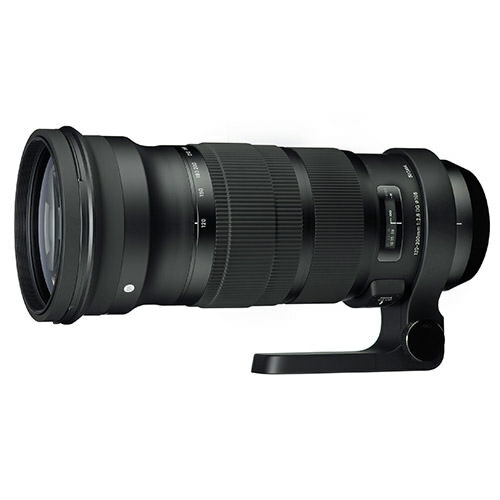 Recent Sigma lens names have been quite short and, officially, this lens is simply called the Sigma 120-300mm F2.8 DG OS HSM. As you can see, it is a telephoto zoom lens with focal length range of 120-300mm and a wide maximum aperture of f/2.8 throughout. DG means it is designed with full-frame cameras in mind, so can be used on such bodies as Nikon D800 or Canon 5D Mark III (obviously you need an appropriate mount version for either system). The lens has Sigma’s ring-type ultrasonic autofocus motor (HSM) and optical image stabilization (OS). The lens belongs to Sports product line (S). Digging further in the description we can see that it features SLD and FLD glass elements to counter chromatic aberrations and improve sharpness, and is made of Thermally Stable Composite (TSC). There are no separate abbreviations for it, but the lens also incorporates some dust and water protection and the filter thread is a massive 105mm in size (Ø105). That’s pretty much it! Thanks guys. All the brand nomenclatures are really useful. Zach, thank you, we hope to cover all of them eventually and add them to our lens database. Good info…I need to buy Canon 700D body with Sigma 18-300mm DC OS HSM lens…is it compatible ?? as i heard from s friend as sometimes Sigma lens AF doesnt suit canon body . Autofocus doesnt match..i need some info on this. i have a Sigma 28-70mm F2.8 EX DG D.
I am also wondering what D is for. I guess it means Digital. I have seen a lens which is 28-300 DG Macro, is it compatible to VR technology of Nikon? I bought one with OS earlier which is I think Optical stabilization. I know this article was written a while back . Just read it and a huge thank you. Now I finally got my head around the Sigma lenses I have in my bag. Pleasantly surprised to find two are full frame and quality lenses. Just upgrading to a full frame camera body and now know no need for me to buy new full frame lenses. Great article very clear ! !